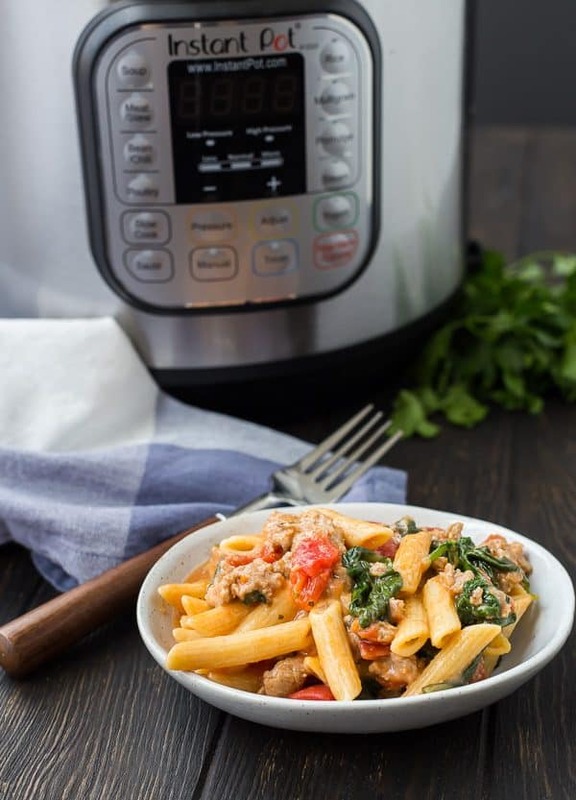 A complete pasta dinner, made in your Instant Pot! 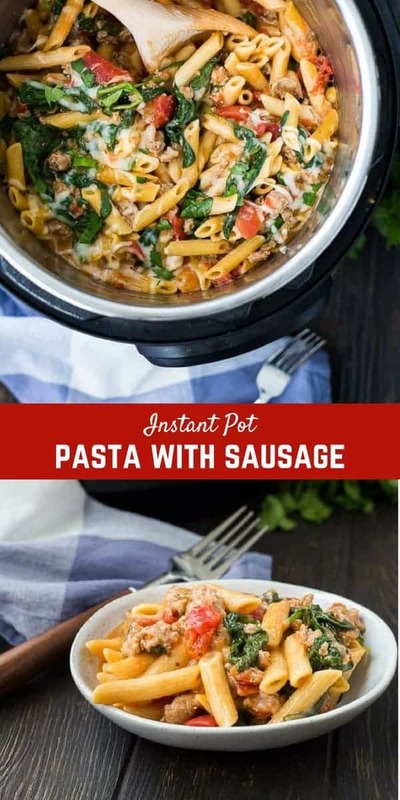 You’ll love this Instant Pot Pasta with Sausage, Spinach, and Tomatoes. You might have all the ingredients on hand already! It’s healthy, satisfying, easy, and versatile, and you’re going to keep making it again and again! My Instant Pot is slowly but surely finding a permanent place on my countertop. It always gets used for making boiled eggs and shredded chicken. I also love Instant Pot sweet potatoes – what’s your favorite use for your pressure cooker? Naturally, I’m looking for more ways to use it, and I’ve been getting so many requests from you guys! You wouldn’t believe how many people ask me for more Instant Pot recipes, so clearly I’m not the only one with an infatuation. I’m nearly as obsessed with one pan pastas as I am with pressure cooker recipes, so it’s probably no surprise that the two recipe categories were going to collide at some point. That point is now. This Instant Pot pasta is cheesy, creamy, filling, and so flavorful. Would you believe that (per my non-RD calculations), it only has around 300 calories per serving? You really can have it all with this pasta. To keep this one pan pasta super filling and still nutritious, I used whole wheat pasta, turkey Italian sausage, and lots of spinach! Tip: Prefer pork sausage? Go for it, but make sure to drain the grease off before adding the pasta and the rest of your ingredients. You start by sautéing the sausage and onions and then you add garlic, diced tomatoes, chicken broth, and oregano. These ingredients together form a fantastic sauce for the pasta. Since the pasta cooks right in the sauce, you’re left with a naturally creamy sauce thanks to the starch from the pasta. Buuuuuut I wanted it even creamier, so we’re going to go ahead and melt some mozzarella in there. The cheese also helps thicken the sauce a bit which helps it cling to the pasta. 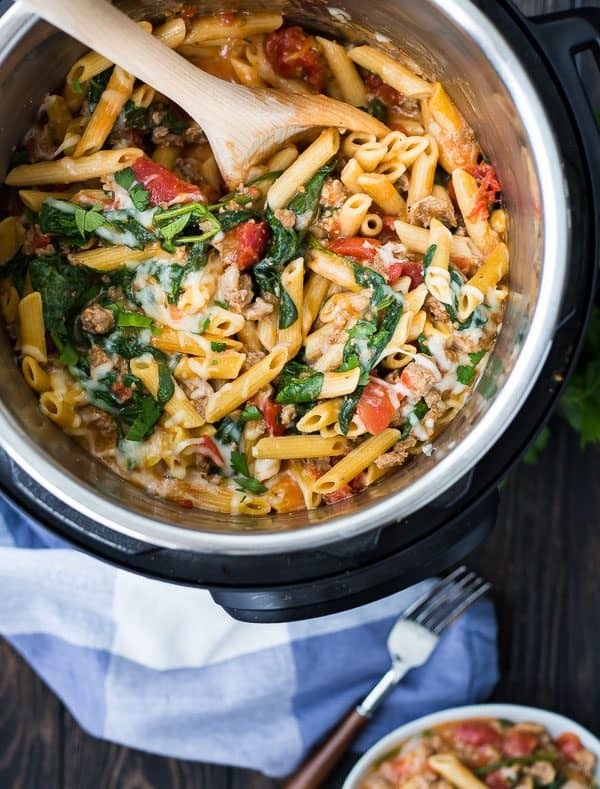 If you guys liked my other one pot pastas — copycat Healthy Hamburger Helper, One Pan Rigatoni with Creamy Tomato Sauce, or Taco Pasta, you’re going to love this one too! It’s not pasta, but I know a lot of you really like my One Pan Quinoa with Ground Turkey, too. Tip: In a hurry? If you want to take a couple of minutes off the cooking time, you can add the spinach right on top of the pasta before you pressure cook it instead of wilting it in at the end. Don’t stir it in (you want the pasta to be submerged in liquid), just set it on top before securing the lid. It won’t retain its bright green color quite as nicely, but it will still taste great. I like to do it at the end because we eat with our eyes first, but really, it doesn’t make a difference in taste, so do what works for your schedule! Want to make this ahead of time or turn it into a freezer meal? Make as directed and then pour into a greased 9×13 pan. Top with more mozzarella cheese (1/4-1/2 cup) and cover with foil. Freeze or refrigerate until ready to bake. Place cold pan in cold oven (prevents it from shattering from the shock of cold to hot) and preheat oven to 350°F. Cook for an hour, uncovering in the last 15 minutes, or until heated through and cheese is melted. It may require slightly longer cooking time if frozen. If cooking from frozen, you may also thaw overnight in fridge before baking. PS: Want to know which Instant Pot to get, along with tons of cooking tips for using a pressure cooker? Read my complete guide to cooking with a pressure cooker – you’ll also find lots of great Instant Pot recipes! The next pasta recipe I want to try in my Instant Pot is this Instant Pot Cauliflower Mac and Cheese from my girl Erin over at Well Plated. I also can’t wait to try Ali’s Instant Pot Crispy Carnitas. What are you guys cooking? Heat Instant Pot to “Sauté.” Add oil, sausage, and onion. Cook, breaking up sausage into small pieces, until sausage is no longer pink and onions are translucent. Add garlic and cook for 1-2 minutes or until garlic is fragrant. Add chicken broth, pasta, diced tomatoes, and oregano. Stir to combine and make sure pasta is submerged in liquid. Set Instant Pot to “Manual” for 5 minutes. Turn valve to Seal. When the timer goes off, turn valve to Vent to Quick release the pressure. Keep Instant Pot on Warm and add spinach and place cover on (don’t turn to latch). Let wilt for 2-3 minutes, stirring as needed to help it along. Add 1 cup mozzarella cheese and stir to melt. If the sauce appears thin, let set for 5-10 minutes, it will thicken. I like sweet Italian Sausage but you can use spicy if you prefer a little heat. Make sure to use low-sodium chicken broth in this recipe. It can get salty quickly because of the sausage and cheese so you want to control it where you can. If you want to amp up the vegetables a little, you could add a diced sweet bell pepper or diced carrots when you sauté the sausage and onions. If you’re in a hurry, you can add the spinach on top of the pasta before you pressure cook it instead of wilting it afterwards. It won’t retain its bright green color as well, but it will still taste great. To make ahead or turn into a freezer meal: Make as directed and then pour into a greased 9×13 pan. Top with more mozzarella cheese (1/4-1/2 cup) and cover with foil. Freeze or refrigerate until ready to bake. Place cold pan in cold oven and preheat oven to 350°F. Cook for an hour, uncovering in the last 15 minutes, or until heated through and cheese is melted. It may require slightly longer cooking time if frozen. If cooking from frozen, you can also thaw overnight in fridge before baking. 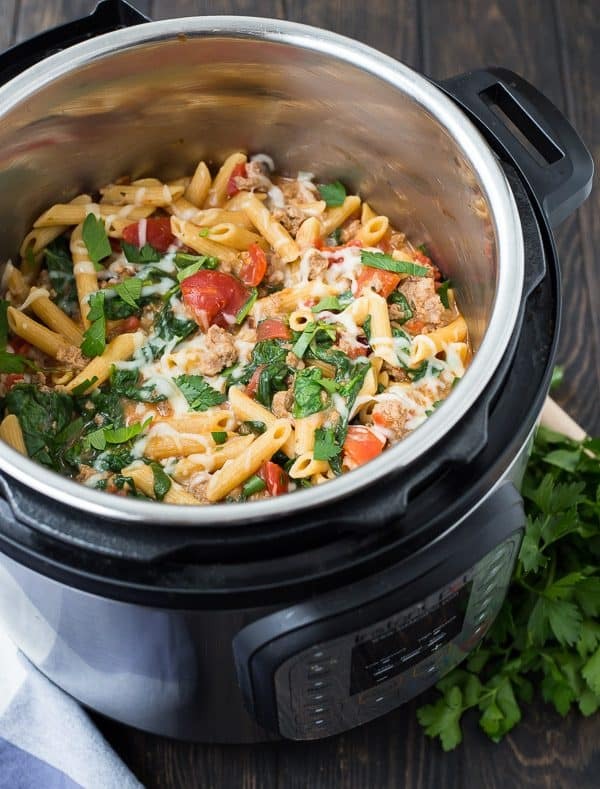 Verdict: This Instant Pot pasta is not only super easy to make (only one dirty pan, yay! ), but it’s comforting, healthy and delicious. I call that a win! Husband’s take: Ben loves this pasta – the leftovers are great for his lunch. Changes I would make: None are necessary, but in the recipe notes, I included some adaptations you could make. Oh I’m so happy to hear that! Thank you for taking the time to come back and leave a comment! I’ve never had that experience! Did you have your valve turned to “seal” and not “vent?” I’ve made pasta in the IP many times and it always comes out great! This dish was super easy and very good. I used a whole box (16oz ) of whole wheat penne, 32 oz of chicken stock, 28 0z of canned diced tomatoes, used spicy chicken sausage, 10 oz of fresh spinach (I like to destem and tear Into pieces before adding, also threw in some corn at the end. Will be making this one quite often. This turned out perfect. Forgot to add the cheese at the end but after eating found out it wasn’t necessary. Thanks so much for a great recipe. So glad you liked this recipe, Sue! Thank you for taking the time to come back and leave a comment! That should work fine! I’d thaw it first and try to squeeze out as much liquid as possible so the pasta doesn’t get too watery. I’m commenting again because I made this last night and it was a huge hit in our house. That makes me so happy! Thank you for taking the time to leave a comment! I love the addition of mushrooms! So glad you liked this recipe! Thanks for taking the time to let me know! This was my first time making pasta in the Instant Pot, and the whole family loved it! I used crushed tomatoes instead of diced, and Barilla Protein Plus Rotini. Cooked at high pressure for 5 minutes, then sprinkled in some fresh basil before serving. It came out with the perfect texture. Thanks for a great recipe! So happy to hear you liked this! The fresh basil is a great touch! I tried this recipe and it was amazing in taste. The problem I had was it was more like soup :(. Should the tomatoes be drained perhaps? It thickens up a few minutes after it cooks, but it shouldn’t be like soup. Are you sure you got all the measurements correct? made it today – awesome flavors, texture and had alot of leftovers. There was just 2 of us, so i have lunch for the week! Highly recomend this meal! I’m so happy to hear that you liked this recipe! Thank you for taking the time to come back and leave a comment, it means so much to me! You mention amping up the vegetables by adding them to the saute step, would something like sliced/chopped zucchini be fine to add in this step also? I’m worried leaving it in for the 5 minutes of pressure cooking would result in it being too mushy. Was thinking of adding bell peppers/zucchini together to this and was trying to figure out the best way, thanks for any feedback! I think bell peppers would probably be okay, but zucchini would probably turn to mush. I would maybe just cut the zucchini very small (matchsticks, or spiralized?) and add it in after pressure cooking (before the spinach), stir it in, and let it just cook a little with the heat of the sauce while the spinach wits. Otherwise, you could saute it separately and stir it in after but that gets another pan dirty. I am new to instant pot creations. I see in the title of this article that it says “with video” but cannot seem to find the actual video? Looks delicious! Are you on desktop or a phone/tablet? 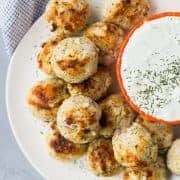 On desktop, the video is right after the photo but as you scroll down the page, it will move with you so you can continue to watch as you read the post and view the recipe. 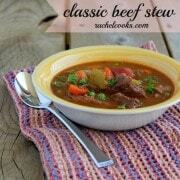 This is very reminiscent of a Weight Watcher’s recipe I make on rhe stove top, but in one pot! I was worried about the pasta getting too soggy, but that didn’t happen. My sauce thickened fine, but it was a little too saucy for my taste. I think I’ll only use one can of tomatos in the future and nix the mozzarella. It made a cheesy mess of my pan and my plastic pan scraper thingy and didn’t really mix in. I think I’d prefer my fresh grated parmesan, maybe some mixed in and some on top of the final product. Oh, and I have a Mealthy Multipot, not an Intant Pot and am a first time user. I’m chuffed at how easy this was to put together– and so fast! Thank you! So happy to hear you liked this recipe, Laurie! Thank you! This is FANTASTIC! Awesome comfort food. I added in a heaping of Penzy’s Sicilian seasoning!! Thanks so much for the recipe. This is a keeper! So happy to hear it! Thanks for taking the time to come back and leave a comment! Changed it up a little… But made it, and LOVED IT…. Used chicken breast instead of the turkey sausage. Used half fire roasted diced tomatoes w/ green chilies and half regular diced tomatoes… Will be making this pretty often! Will try the turkey sausage next time. This was delicious! Used a Chicken Parm Italian sausage, added chopped carrot, zucchini, roasted peppers, red chile flakes and a chunk of Parmesan rind to the pot plus lots of Spinach after PR. SO, so good! I just ladeled any excess broth from the pot and saved it for another use. Freezing leftovers too! So glad to hear you liked this one! Thanks for taking the time to come back and leave a comment. Good call on the Parmesan rind! 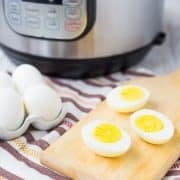 Great, easy recipe for a first time instant pot user! Thank you, will make this again! I’m so happy to hear you liked this recipe, Dana! Thanks for taking the time to leave a comment! curious if I could use canned spinach. I have no fresh spinach and my kids are napping and I won’t have a chance to get out and get it….. I think that will work! Just drain the liquid out pretty well so it doesn’t get too watery. Made a few small changes to ingredients. I used hot Italian sausage, two tsp of better than bullion roasted garlic to the chicken broth and ten ozs of spinach Three thumbs up and five stars! I’m so glad you liked it! Thanks for taking the time to come back and leave a comment and review! I made this with 2 cloves of garlic, 2 14.5oz cans of tomatoes, 13oz of sliced turkey sausage, 8 oz frozen spinach, and it turned out yummy! I also used a 1lb box of white flour penne, 4 cups of chicken broth (low sodium like it says), and little extra veggie broth I had on hand to make sure the pasta was covered. I did have extra liquid but I left it on sauté and added extra mozzarella cheese to thicken it. I’m a full time grad student so thanks for the easy recipe that will feed my husband and I for several days :) I also used a vegetable chopper for the onion so I had eaten dinner and loaded the dishwasher in an hour. I love it! Thanks for taking the time to come back and leave a comment! Gotta love a good easy recipe! Best of luck with grad school! Can this be made with gluten free pasta? Cooking time change? I haven’t tested this recipe with gluten free pasta yet, but I think it would work! Let me know if you try it! We make this almost every week since finding the recipe! It’s SO easy and so delicious and so fun to tweak. I end up using turkey sausage links just to speed things up, and I add whatever veggies are sitting around. Thanks for the great dinner inspiration! Oh I’m so happy to hear that! It is a great one to use up veggies in the fridge! Thanks for taking the time to come back and leave a comment! So easy! Great directions – simple to follow. Yummy! We loved it! Thanks for the recipe! I’m so happy to hear that you liked this recipe! Thank you so much for taking the time to come back and leave a comment! Brilliant recipe, everyone loved it, will definitely make again. I’m so happy to hear that! Thanks for taking the time to let me know! 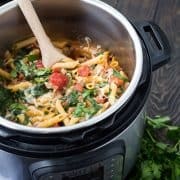 Do you know how I can convert this recipe for a 3 quart Instant Pot? I would try just halving all the ingredients…that should work! Let me know if you try it! So, how did you come up with your nutritional value? When I added the recipe into MyFitnessPal, it came up with a higher calorie value (386 cal. )…and I omitted the cheese when I made it. I also added some corn starch since I wasn’t going to be using cheese to thicken it and it worked well. Hi, I also used MFP, but I have noticed that it varies and I put in and change ingredients to make sure all the measurements are coming out somewhat accurate. However, it remains an estimate. I’m glad you liked it, though! I’ve made this two times in as many weeks, and I’m happy to report it works beautifully with lentil pasta as well. I’ve also added some pre-cooked shredded chicken. This recipe is so versatile, I’m so glad to have found it! Good to know about lentil pasta! Thanks for taking the time to come back and leave a comment! This was excellent. I did make some changes because I’m a vegetarian and I hate using part of a package of pasta. So, I used Beyond Meat Hot Italian Sausages, 1lb of pasta and 4 cups of vegetable broth. I also added some mushrooms, roasted peppers, extra garlic and some basil. I know it sounds like a lot of changes, but it’s just individual taste and proportions. The timing worked perfectly and that’s what I was really after. Thanks for the recipe. Cooking is made to have fun with and make changes! I’m glad this recipe helped you! Thanks for sharing your changes so other people can try them too! Hi Rachel, thanks for the recipe! So it turned out really tasty, but for me it was still really liquidy and soupy, even after letting it sit to thicken 10 minutes. I followed the recipe “to a T.” Any thoughts on why this could be? TBH, I find that many of the recipes that have a sauce come out “soupy” for me, so I may be doing something wrong?! Did it continue to thicken up at all after sitting a little longer? You could try reducing the liquid slightly next time. Easy recipe and turned out great! Even my picky kids loved it. Thanks! uh, you don’t list the chicken in the ingredients listing on the recipe. This recipe doesn’t actually include chicken. Are you looking for this recipe? Let me know if I can help! I hope you love it! Let me know what you think! I’m guessing this would work well as a stovetop recipe too. It would definitely work on the stovetop! Made this tonight! Hubby said best IP recipe yet! And gave it 5 stars! Yummy! !I used chicken sausage and cheddar and Parmesan cheese! That makes me so happy! I’m so glad you both liked it. Thank you for taking the time to come back and leave a comment!